Now not all women are bad drivers, but we all know the women who are....and who have probably done at least half of these things mentioned below, hehe. Some days mascara is essential and we just didn’t have the time to apply it at home. It was one of those hectic days. The more cautious driver will wait for red lights to apply and crimp only to be honked at when the light turns green. While the daredevil will apply with one eye on the road and the other in the mirror or so we like to believe. We all know that girl that keeps half of her wardrobe in the back seat or in her trunk. For the really bold at heart, they will change clothes during stops. This is mostly done by passengers but I have seen a few drivers take part. The art is in the way the clothing is exchanged while avoiding being arrested for indecent exposure. It takes a trained professional to change clothes without showing a lot of skin. We should hire a robot from the future, send them into the past to kill whoever invented nail polish before they were born. I know some ladies are fans of the polish, but what a tedious task, paint, chip, repaint, smudge, repaint, rub off, repaint, Holy Mother of God! Well society says if the toes are showing get the paint a flowing. Ok no one really says it in those terms, but it is a must have for some women and they will polish those piggies on the road. Oh yea, the modern women. We are independent, our own personal accountants, and we can manage our bills on the go. For those of you new to this strategy here is a quick how to: save all billing phone numbers in your phone, place your credit card right below your speedometer so you can shift your gaze from the road to your credit card just like you would if you were checking your speed, call the billing company, and read off your card numbers to pay your bill. Easy peasy. Oh yes, the old stereotype that men don’t like asking for directions. With today’s technology asking people for directions is so 1999. 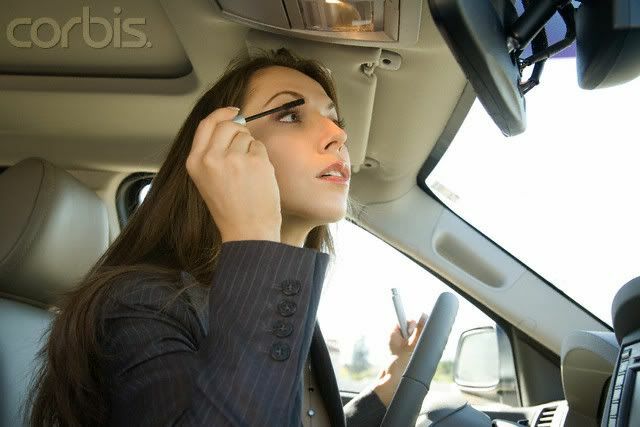 Women multi-task by using gps navigators in their cars or on their phones and if it is not voice enabled we can still find our way by manipulating the screen. Many say that after years on the road we develop lazy habits and it may be a good idea to take a refresher course. I say these women are far from lazy. If anything they need less to do. I’m sure some men are gifted with these unique talents as well. Thanks for the driving tips, I will never paint my toenails at home again! Thank goodness I am not one of those girls.